The printing state greatly affects the fillet shape after reflow and the defect occurrence. A quantitative grasp of this relationship will be able to clarify the cause and measures and effectively implement the PDCA cycle. In addition, this can be systematically reflected on the management of maintaining the results of the measures. 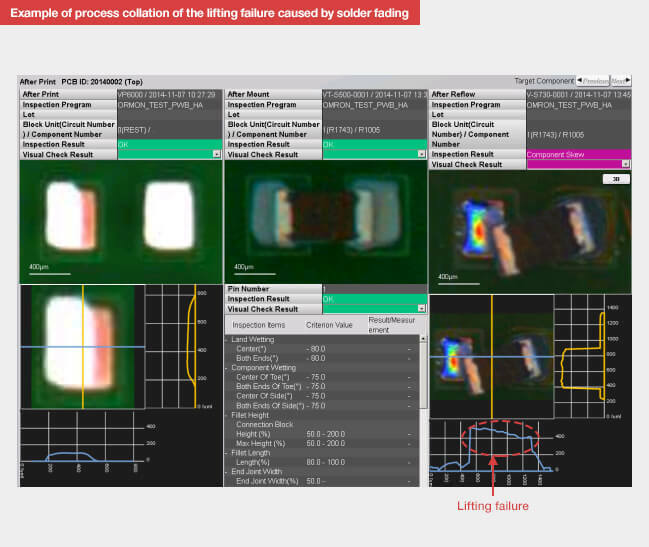 This is an example showing the influence of supplied printing solder volume on the fillet shape after reflow. 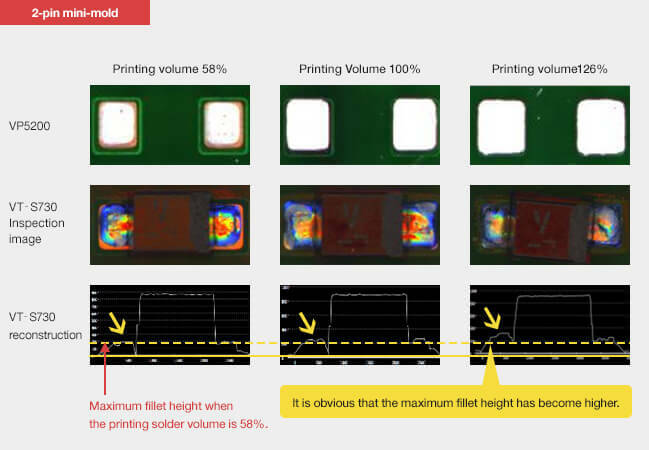 As a result of observing how fillet shapes of the 2-pin mini-mold and SOP become by changing the mask opening area, any example shows that the more the printing solder volume increases, the larger the fillet shape becomes. Therefore, it is necessary to determine the mask opening and mask thickness for the fillet shape considering the production and quality. 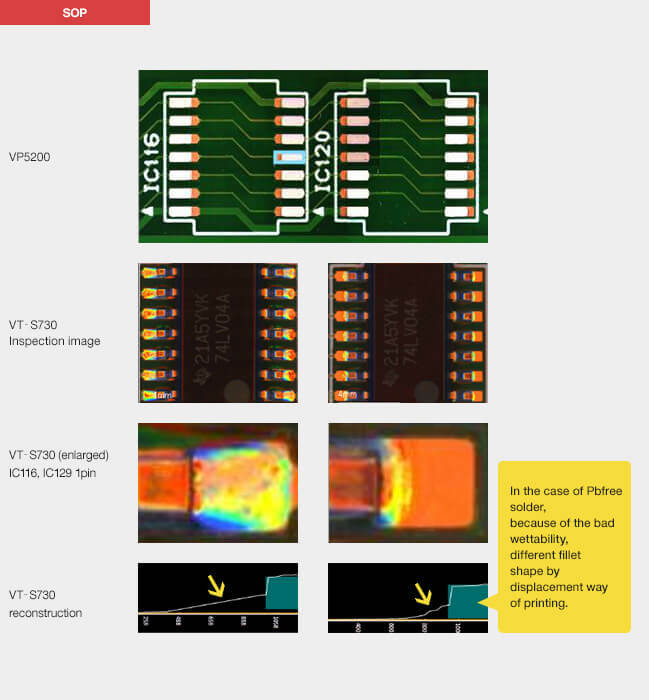 If the relationship between the printing solder volume and the fillet shape is clear, the solder volume for the target fillet shape can be determined and managed, and the fillet shape can be stabilized. In other words, the appropriate fillet shape can be pursued. Not only the reliability but also the fillet shape that can be easily inspected can also be pursued. The following are examples where the fillet shape changes depending on the printing shape. Example shows the comparison of fillet shape differences by creating the mask opening so that printing fading is inside the land at IC116 and outside the land at IC120. 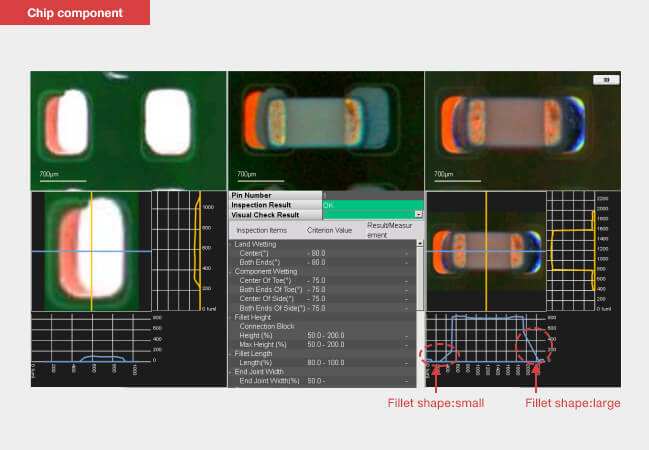 This result suggests that the formed fillet differs depending on the solder volume at the front fillet side. 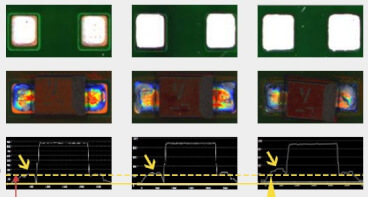 This is caused by the small wet-spreading property of Pb-free solder. The printed solder should be managed and designed, by paying attention to which parts of lands and components are faded. However, printing at IC116 is not necessarily desirable considering the heel fillet that cannot be seen in a visual inspection. 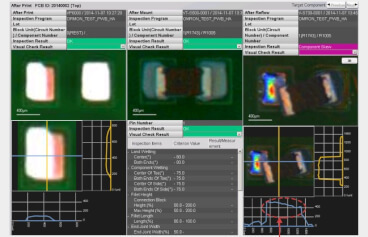 Example shows that fading occurred only at the other land of the chip component. In this way, VT-S730 can compare the difference in the fillet shape size. 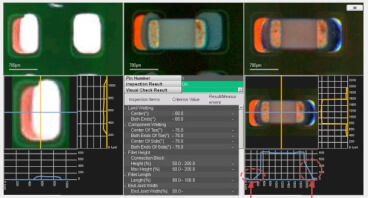 Example shows that the influence on soldering after reflow was confirmed by creating a mask opening so that the printing solder fading becomes a, b, c and d.
The image after printing is an image that prints the solder paste and the result of reflow after mounting a condenser chip on it is the image after reflow. 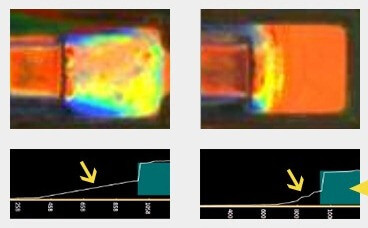 This result suggests that the lifting detect occurs at a and c locations. 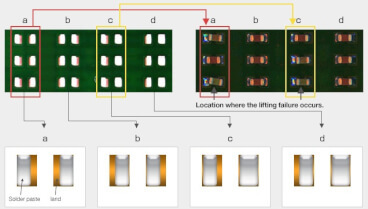 The occurrence of lifting failure was caused by the impossibility of soldering because the contact with the electrode lead of the component became small due to inside solder fading. Even if the outside of land gets fading, the influence on the lifting failure becomes small. To reduce occurrence of the lifting failure, printing shape and misalignment should be managed by the post-printing inspection machine. 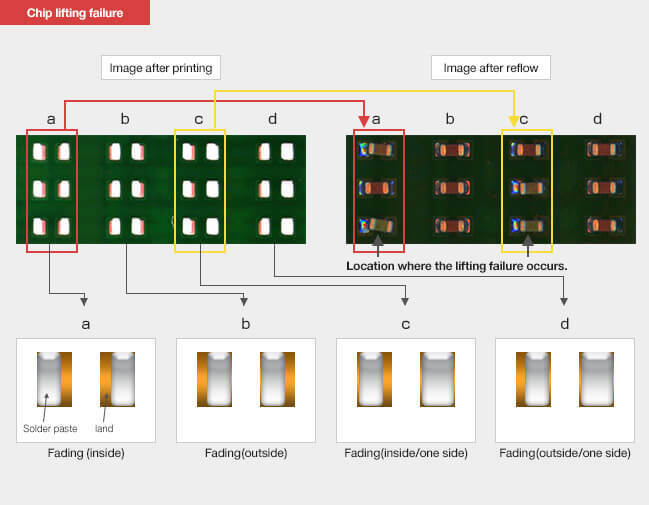 A lifting failure occurred on the faded land side in the example where fading of the solder when printing occurred inside the land. 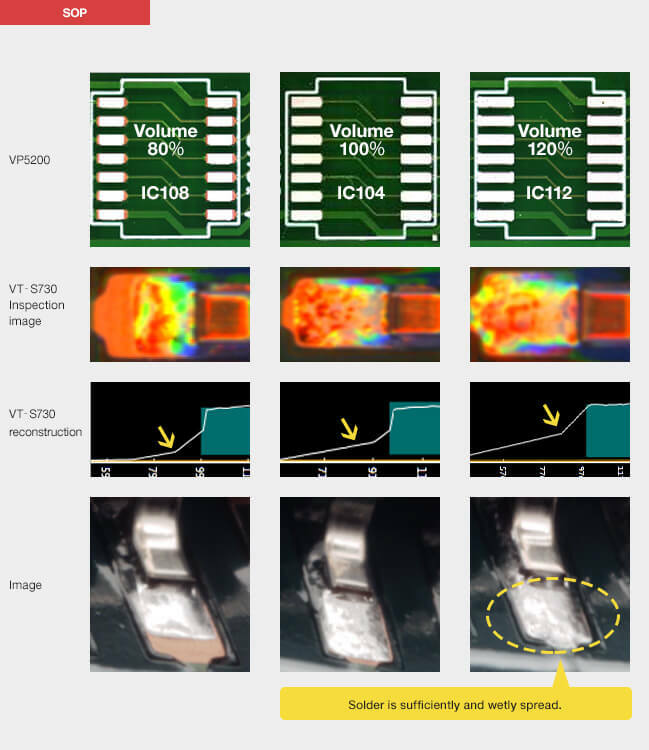 It is possible to eliminate this failure by inspecting the solder supply volume at the printing inspection.